the dilation of the ductus deferens at the base of the bladder where it approaches its contralateral partner just before it is joined by the duct of the seminal gland to form the ejaculatory duct. 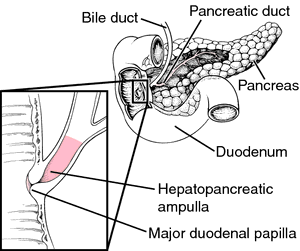 The dilation of the ductus deferens where it approaches its contralateral partner just before it is joined by the duct of the seminal vesicle. Synonym(s): ampulla ductus deferentis [TA] .